Last year I was contacted by first time author Joyce Anderson, who was researching and compiling information for her first book on horse racing. 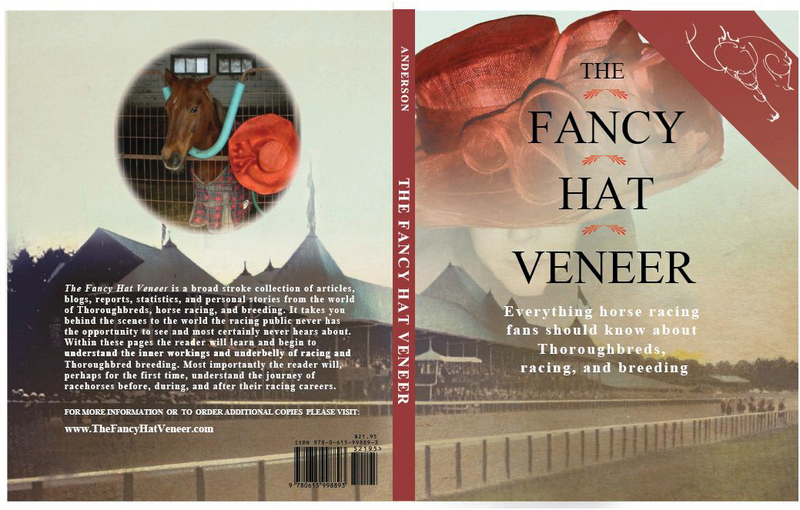 “The Fancy Hat Veneer,” is the result of her research; it is a compilation of information proving the undeniable responsibility the racing industry and Thoroughbred breeders have for thousands of racehorses being sent to slaughter every year. 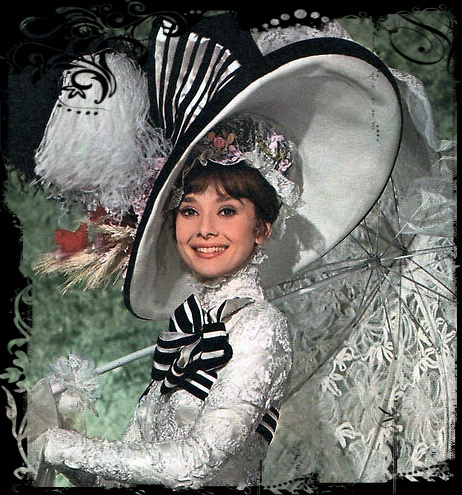 Joyce chose the title because, for many horse racing fans, fancy hats have become a fashion statement by women attending famous races such as The Kentucky Derby at Churchill Downs. 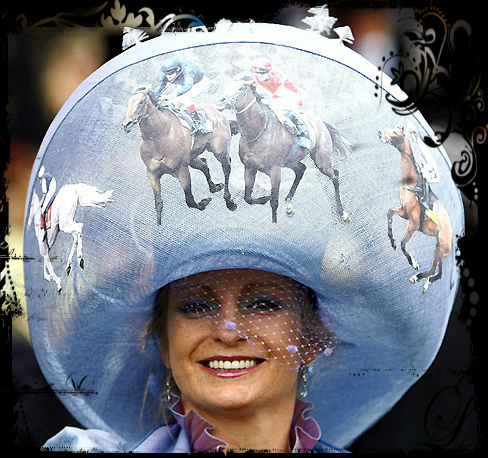 The fine clothing of the spectators is the biggest tradition in thoroughbred horse racing, while the brutality and horrors of the racing world are kept from the public….well hidden by “The Fancy Hat Veneer.” As we know, a “veneer” is a thin layer of wood that covers what is under it, so the actual commodity itself appears more refined and polished. The book is a broad stroke collection of articles, blogs, reports, statistics, and personal stories from the world of Thoroughbreds, horse racing, and breeding. Selected articles take the reader behind the scenes to the world the racing public never has the opportunity to see and generally does not hear about – the underbelly of racing, breeding, and the journeys of racehorses before, during, and after their brief careers. If you would like a bit more insight into the book please visit www.thefancyhatveneer.com where the book can also be purchased online. 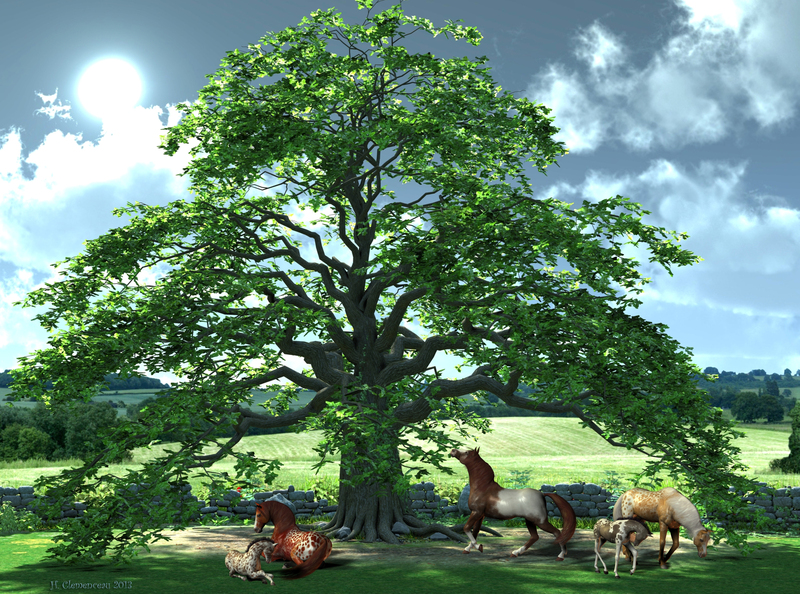 Horses have been an integral part of our life and our survival since rehistory. They have been warriors, workers, allies, companions, protectors, explorers and even teachers and therapists. Horses have died on battlefields, transported goods, carried our families, moved canal barges, couriered mail, pulled fire engines, provided transportation and plowed the fields. They have performed every task we have asked of them. They have more than earned the right to a full life. Press Exclusive’s journey and photographs are reprinted with permission of Mindy Lovell of Transitions Thoroughbreds who intervened and pulled her from the gates of hell to safety and Susan Wagner of Equine Advocates who provided Press Exclusive with a safe forever home. Her story is not an unusual one for Thorough­breds. However, the end of her story is unusual. She is one of the lucky ones. The particulars of how she was discarded and the severity of the injuries she sustained are an unforgivable occurance. Individual Thoroughbred breeders can “produce” a few, a few dozen or few hundred foals each and every year. This is done with the full knowledge that approximately 70% +/- will not have the opportunity to live their full life, the majority will not survive past the age of 10 and only a small fraction will ever be “good enough” to race. This is of no concern to the breeder. Their job is to crank out as many as they can. In fact, the Thoroughbred breeders want to increase breeding numbers and also want more funding for that purpose. They have no conscience. Remember Barbaro? He was euthanized at 3½ years old due to catastrophic injuries sustained while racing. Eight Belles was euthanized at 2½ years old due to catastrophic breakdown while racing. Young thoroughbreds die every week on racetracks from injuries sustained while training and racing. When Rachel Alexandra lost her last race she was shipped off to be a baby making machine. She suffered grave complications at the birth of her first foal. Horse Racing Wrongs is a blog by Patrick J. Battuello who meticulously documents deaths and injuries of thoroughbreds on America’s race tracks. The entries are not Mr. Battuello’s opinion; he is simply documenting what occurred. They are unalterable facts. Each death occurred on the race tracks while the crowds cheered. This chapter contains just a few blog entries for the recent 2013 racing season. There are several hundred additional entries you can read for yourself on www.horseracingwrongs.com. 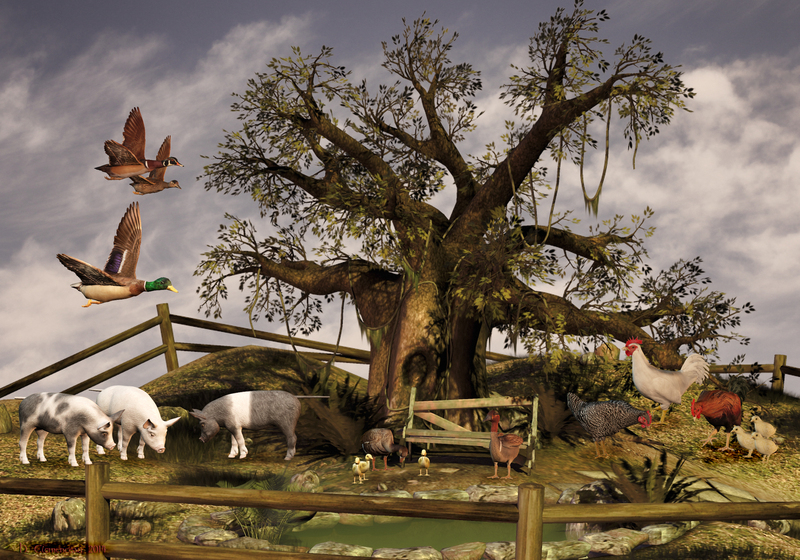 Patrick J Battuello has been writing on animal-related issues for several years now. 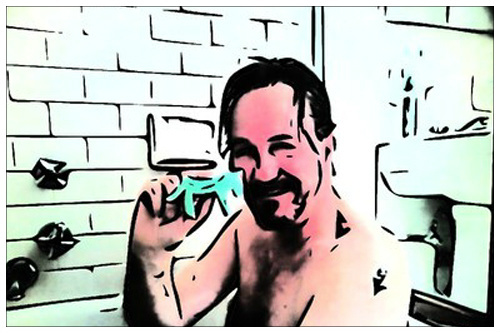 His blog, “Animal Rights,” debuted in the Times Union (Albany NY area) in 2009. It was the first of its kind in a Capital Region mainstream publication. In addition, Patrick has written for both the Albany and National editions of the Examiner, and has maintained three separate independent sites. Before we even discuss slaughter you should know how horses are transported to the plants. Horses are usually transported in stock trailers, which are open without compartments. All types of horses are together; old, young, babies, sick, injured, pregnant and blind. Thoroughbreds, work horses and miniature breeds are loaded on the same trailer. Those that are injured, too small or too weak to withstand the long trip are trampled. When the trailer arrives at the slaughter plant those that have been trampled or are down are dragged out with a chain wrapped around their neck or a leg. 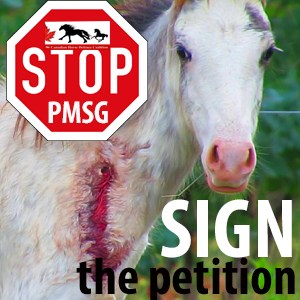 Horse slaughter is a savage, cruel, violent and barbaric solution to a man made problem. It is horrific, excruciating and brutal. Nothing about it is humane. In my opinion horses are the most brutalized, abused and mistreated animals. Maybe it’s their size or maybe it’s their beauty that makes men need to dominate, control, brutalize, harm and torture them. There is something very deep, very dark and very, very primitive still lingering in our un-evolved psyche. We live in a society where people are emotionally dead. Perhaps it’s the internet or social media which has removed us from any personal sensitivity to horror, blood, guts and gore. Thanks to all the groups within the media industry (TV, films, computer games, etc) we have become immune to violence. We can witness the most appalling atrocities first hand and there is little or no reaction. It barely causes a ripple. The “In the News” chapter could have been filled with a ton of recent horrific articles. Sadly there is no lack of appalling stories related to horses. If you are inclined to read more the internet puts every news agency in the world and their archives at your fingertips. 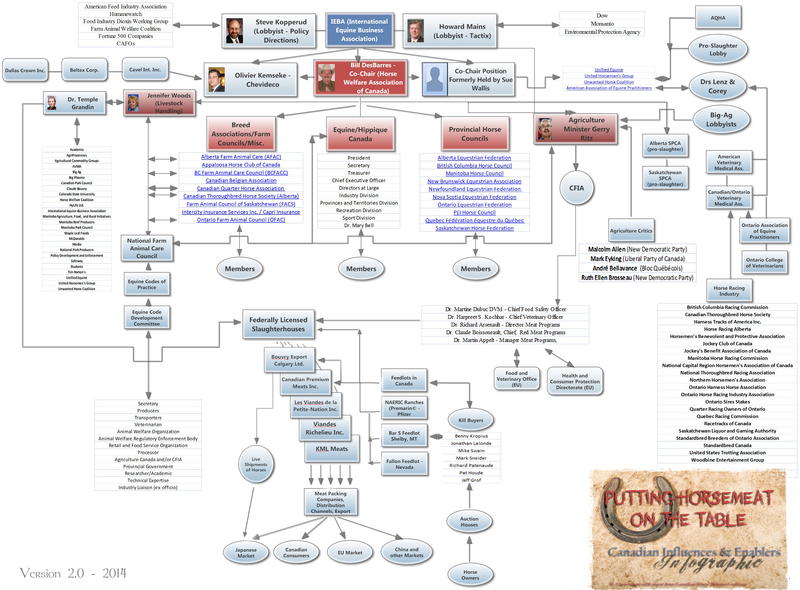 This infographic (downloadable here), updated over my original 2012 version, exposes the hand-shaking and back-patting relationships, endorsements, and interconnectivity between the US and Canada. We can clearly see the tentacles of the Bill DesBarres’ Horse “Welfare” Association of Canada extending themselves into the breed associations, farming groups, Big Pharma, veterinary colleges and associations, and Equine Canada. By way of the lobbyists in the IEBA, we are influenced by Big Ag, Dow and Monsanto, Humanewatch and other organizations that not only advocate for horse slaughter, but advocate for GMOs and against the EPA and indeed consumers in general. The Co-Chair position previously held by Sue Wallis is of course vacant, and it’s unknown whether the IEBA itself is actually a going concern., like so many of Wallis’ transitory slaughter groups. We’re unsure whether anyone has or will step into the position, as Sue Wallis was the driving force behind this group. 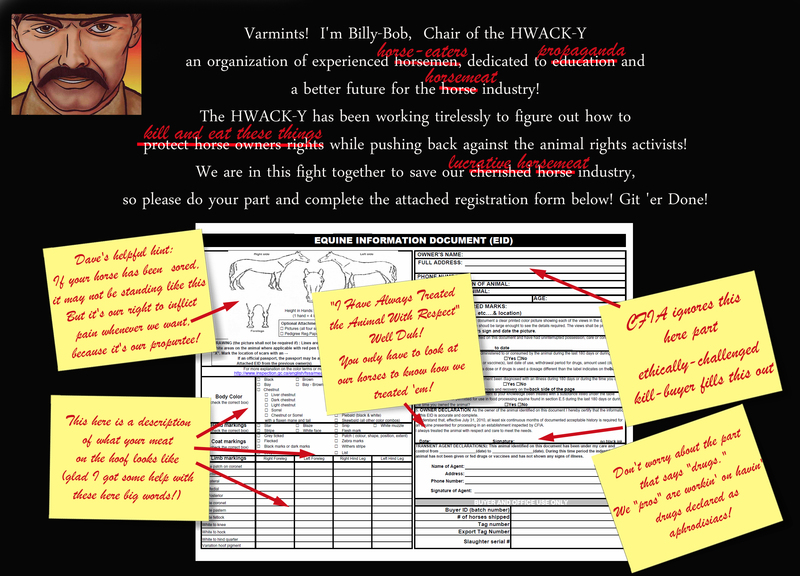 Nevertheless, Bill DesBarres’ connections via the IEBA will no doubt continue to be exploited by HWAC and the horse slaughter industry. 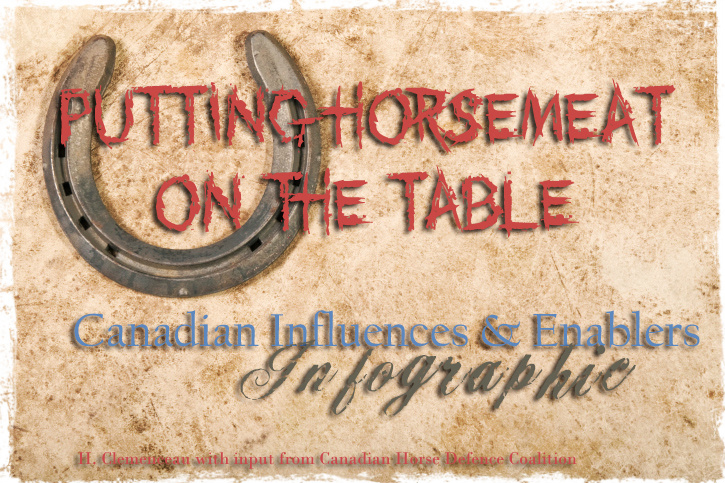 While some of the associations that have been mapped out in the following Canadian infographic do not directly enable horse slaughter, they are complicit in that they are silent against the practice. At the very least they seem intent on preserving the status quo and ignoring the very real threats created not only by horse slaughter, but by the power of Big-Ag lobbyists and governments who are willing to be influenced by them and their client base. People are waking up to what is being done to horses. Very few people condone what is being done, but the industry does everything it can to cover it up because they know it is not humane, no matter what terminology they use. DesBarres himself likes to refer to slaughter as “humane euthanasia,” and a “wonderful option.” Please continue to contact the Agriculture critics, in particular – Malcolm Allen, who has endorsed Bill C-322 in the past and now rejects Bill C-571. 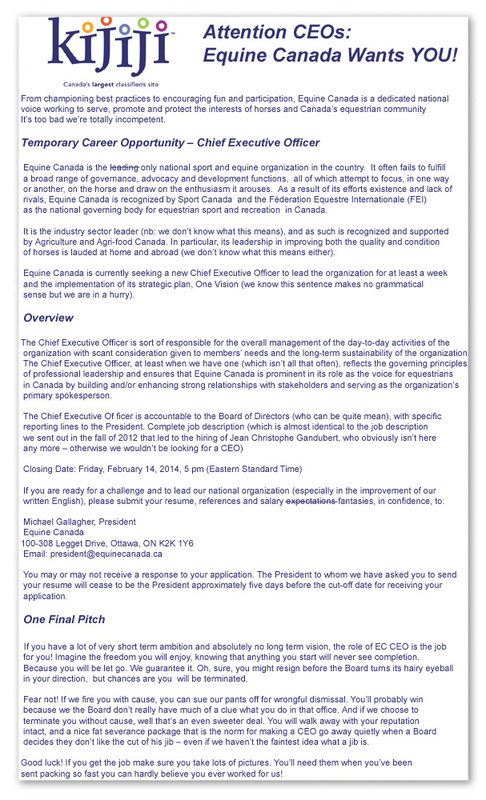 Please write to Equine Canada and insist that they take a more global position to promote equestrianism in Canada. Remind them that the GAO report they tout as the rationale for horse slaughter has been debunked. Here is the current list of provincial associations from the HWAC website. Note that the Ontario Equestrian Federation, which used to be on the list, has been removed. Executive Director 100, 251 Midpark Blvd S.E. There are some in the Animal Rights movement who are as intellectually open minded as are cult members. They seem to believe that people will just go from eating meat and wearing leather to being vegans in one fell swoop. All that is required is posting horrific images and railing against speciesism. If only that would work. In the real world, it doesn’t. Introducing people to compassion and veganism is easy. Getting people to change their lifestyles is not. The so called “abolitionist approach” may make adherents feel righteous and morally superior to others, but it does not help the animals. Consider: People are having babies faster than we are winning people to vegan lifestyles. And the abolitionists aren’t even helping us do that. They oppose transitional diets, vegetarianism, Meatless Mondays, vegan entre additions to school lunches and restaurant menus. If one is not 100% vegan the abolitionists consider them to be the enemy. Not a smart way to make friends or influence people. So called “abolitionists” also oppose single issue campaigns as somehow promoting speciesism. They believe that efforts to save whales, elephants, rhinos, and seals, for example, denigrates the lives of cattle, pigs, lambs, and chickens dying in slaughterhouses. They similarly oppose fighting the dogmeat trade in Asia, bullfighting in Spain and Mexico, pigeon shoots in Pennsylvania, and canned hunting in Africa. They even think criticizing Michael Vick is wrong. The absurdity of their positions is lost on them. Only by reaching out and kindling people’s empathy can our movement grow. As people who love dogs and elephants, dolphins and whales, come to realize that all animals have the right to live and be free of exploitation, the Animal Rights movement will attract new activists and grow. Erecting barriers to that growth is counterproductive and ridiculous. Have You Heard of the Yellow Dog Project? 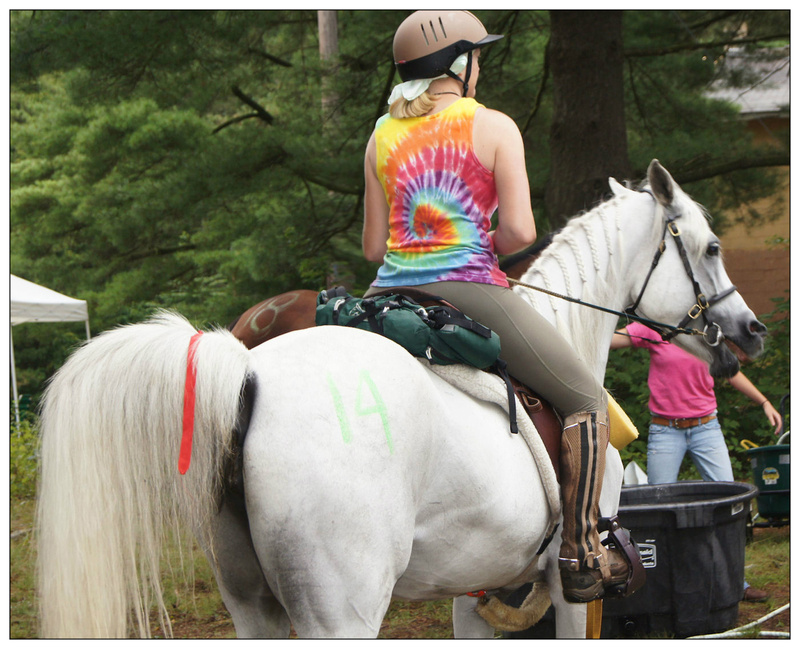 If you’ve ridden a horse at organized trail riding events as I have, you’re probably familiar with the coloured ribbon system on the tail for horses – red for potential kicker, white for sale, green for a horse in training, and generally yellow for a stallion. The system is pretty universally reproduced in trail riding handbooks too. The ribbons are a great visual aid that helps people following horses to know how far back they should keep their horse, to avoid sudden unexpected responses from the horse in front, and to ride safely in a large group. Most every dog owner considers themselves astute to the moods of dogs. 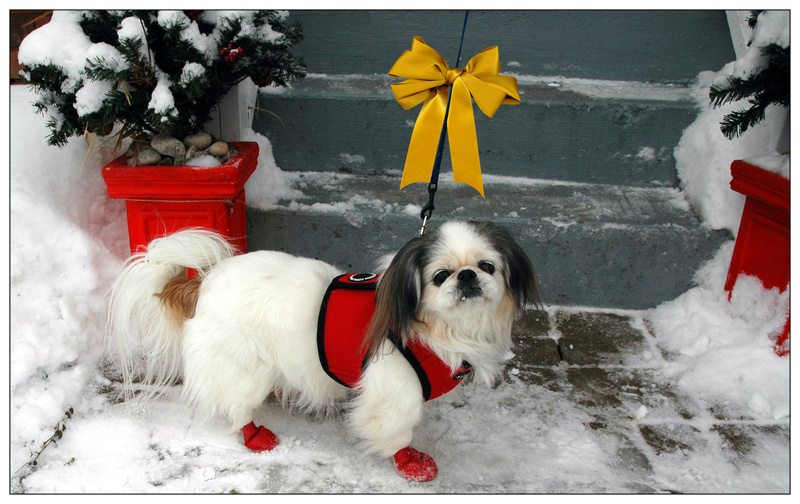 I’m probably no exception, since I don’t automatically reach down to pet an unknown dog, nor do I generally allow strangers to try to pet my dog, a 15 lb, “Lhasa-Shih Tzu-Peke.” But Coco, rescued from a Quebec puppymill in 2008 and adopted in 2009, has some “issues.” Yeah, she’s got quirks. She was afflicted with dry-eye and while in the puppymill, it was never addressed. When she and other dogs were rescued in a public raid, she went to a dog rehabber, and I found her on Petfinder in 2009, after she’d had a litter of puppies, who were also placed by the rescue. Her eyes were severely damaged as a result of the lack of care, and looking into them is like looking into a stained glass window – they are full of strange dark “creases” and “crinkles.” We give her eye drops to prevent them from worsening, but the vet says that there is almost zero reflection back out from the retina, meaning that she is almost totally blind. I think she navigates out on walks by smell, some light and dark sensitivity, and by feeling the change in textures under her feet. She finds her food bowl mostly by smell. She won’t get better, but hopefully she won’t get worse either. Dog socialization and play classes only cause her anxiety – she cowers after only a few minutes of being inundated with playful dogs, growls and snarls at them, and retreats to my lap with her head in my armpit. At these events she’s generally looked upon as the sad misfit who will never be able to mix with the cool kids. While some adults and children are very aware of proper ways to approach a dog, many are not. Quite often, well-meaning dog owners in the community always assume that all dogs are friendly and want to play, usually without regard to the different personalities of dogs, their youth and training, and whether they’re intact or not. So I don’t think it’s safe to assume that the public will automatically respect your space; and while it shouldn’t have to take a ribbon to communicate this, it could help in the most-needed cases. Coco really needs a seeing-eye dog of her own, and as a result, she is often startled by the sudden presence of an unfamiliar dog next to her. Quite often I see a dog on a fast trajectory course for Coco, or children approaching with outstretched hands. Warning growls often go unheeded by young dogs and their owners. On occasion I’ve gotten quite irritated with people for opening the door of their house as we walk by to allow their dogs out to “play” with us. When I explain she’s blind and may bite, they laugh it off and say “Oh, it’ll be a good lesson for my dog.” Well, why is it my obligation to teach your dog any lessons? And what if they come at the expense of both of our dogs if a fight develops? What kind of lesson will your dog take away from this experience? A person should have the grace to step away if the approach by either dog or human is not welcomed, but sometimes they don’t seem to want to accept this. 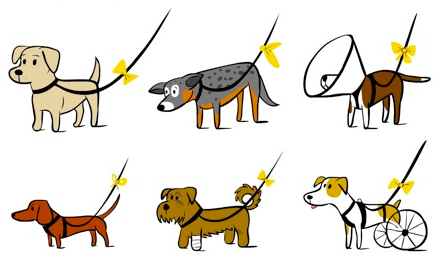 The movement is not intended to warn people way from dogs that may be dangerous, but the ribbon is intended to represent dogs that are scared or skittish, maybe in heat, post-surgery, learning leash manners, deaf, or recovering from an injury. The use of these ribbons – which has caught on globally – was started by Tara Palardy, a positive reinforcement dog trainer in Red Deer, Alberta. 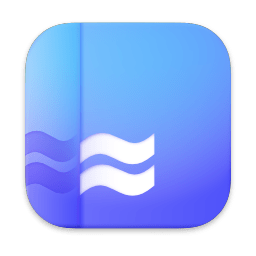 Palardy got the idea from a website launched in Sweden. Since branding her own project, people around the world have started tying bows. She launched a Facebook page for 250 of her friends and clients in September 2012 and now has almost 90,000 followers around the world. The Yellow Dog Project is a not-for-profit organization that now has its own website – http://www.theyellowdogproject.com. It is human nature to want to touch and interact with a dog. 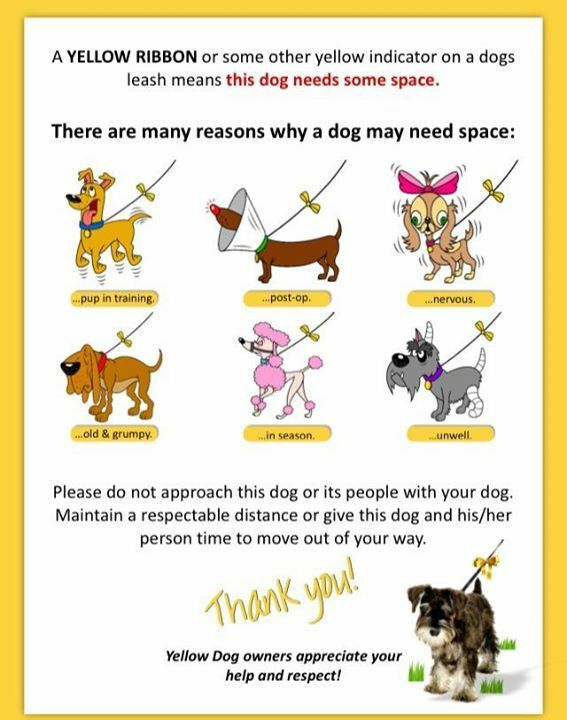 However, I don’t think that it is appropriate for any stranger to allow their dog to rush yours, or to touch or pet your dog without asking first. The expectations we have for dogs are often a continent away from reality. This year I vow to stop caring what other people think and stand up for my dog. I pledge to be patient and explain the yellow ribbon to anyone who approaches and asks. It takes practice to be able to say “no” over and over to the same “friendly” person who isn’t respecting our dog’s needs. But this year I hope to reinforce to my neighbours and those in my community that not all dogs are created equal. You can believe in the five weeks “vacation” or not. There are many reasons why, in my opinion, this mandated “vacation” isn’t all it’s cracked up to be. Especially if it isn’t actually a holiday if horses are sent to Amish country for their R&R, where they are, unbeknownst to the average person, used as work horses on farms they are loaned to. And what is this ridiculous comment about “unlimited feed?” Haven’t the carriage peeps been telling us forever that horses shouldn’t be on grass or they will founder? 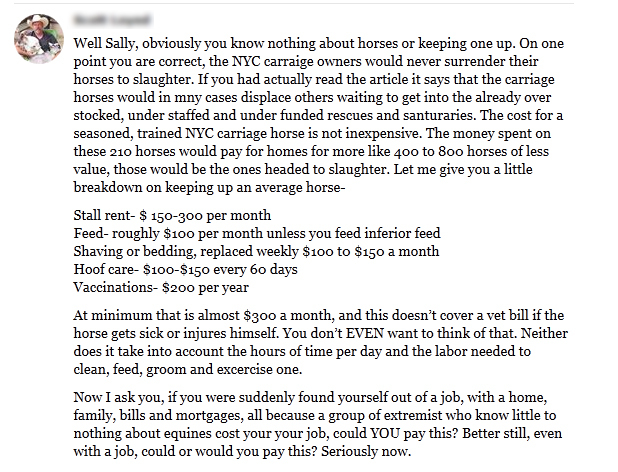 Common sense would seem to dictate that you can’t give any horse unlimited feed either, which shows exactly how much the author of this article knows about horses (or has been spoon-fed). No one can say with any certainly that any of the horses are on a green pasture anyway – the pasture, if it exists, is just as likely to be a dirt paddock. Extraordinary claims require extraordinary evidence. The problem is that the carriage industry may be talking out of both sides of their feedbag. Perhaps they didn’t anticipate that by arriving at the estimate of $15 – $19 million “investment” into New York City, that there would be people who could do basic arithmetic and figure out what the average gross income would be for 68 medallion owners (or half-medallion owners). So now, the claim that “nobody’s getting rich” is much harder for the average reader to choke down. Especially since the vast majority of that income is cash. To further throw shade on the claim that the medallion owners are just working class people struggling to earn a living in this cash-based economy, we have the testimony of ”StopLiesSeeTruth,” a prolific YouTube videographer and carriage owner, who claims to be earning an exemplary income that affords him the opportunity to invest in “real estate and other businesses.” There seems to be a lot of variation in terms of income, depending on whether one is bragging about it, or declaring it for taxation purposes. These are not high liability coverages by any stretch of the imagination. Coverage for only $50,000 for the death of one person is ridiculously low. By comparison, I have an all-perils liability policy for $5 million, at a cost of about $200 per year in premiums. God help any carriage owner who has the misfortune of being the cause of serious injury or death of a young, professional, high income earner in a carriage accident, someone who has a young family or years of income earning potential curtailed by a disabling injury…..
From the same source, we also get an idea of the various permit fees required, which again, will not bring the total expenses anywhere near $25,000. Carriage Operators of North America – CONA also has sourced out several equine insurance providers that can cover mortality, business insurance, life insurance, excess coverages, and insurance against crime. Again, most business people pay for these (with the possible exception of equine mortality) off their pre-tax income, so the carriage trade is not really any different from most other sole-proprietor businesses or partnerships (but apparently would like most people to think their expenses are greater than other comparable businesses). Other incidental permit fees may be referenced by viewing the List of Permit Fees. $100: License Fee for applicants who file for a new Horse Drawn Cab Owner License from April 1 of years that end in an even number to September 30 of years that end in an even number. $75: License Fee for applicants who file for a new Horse Drawn Cab Owner License from October 1 of years that end in an even number to March 31 of years that end in an odd number. $50: License Fee for applicants who file for a Horse Drawn Cab Owner License from April 1 of years that end in an odd number to September 30 of years that end in an odd number. $25: License Fee for applicants who file for a new Horse Drawn Cab Owner License from October 1 of years that end in an odd number to March 31 of years that end in an even number. From the carriage supporter’s basic estimate, we can see that, per horse, basic housing and feed for a horse would be anywhere from $4,740 – $7,740, or possibly more. Neither figures are out-of-line with what horse owners pay to board their personal horses. Some carriage operators have benefited by subsidized rents as well. In 2001, the City of New York leased a stable on W. 45th St. to a carriage operator and his partner charging him a rent of only $5,000 a month while a comparable stable could easily have brought the City $60,000 a month. Even if you consider that the city played a role in displacing the original tenants of this stable, this is a very advantageous cost savings for the carriage operators, but not so much for the City. I wonder what tourist brochures the author is looking at? Cars are allowed in Central Park at certain times. I daresay this writer hasn’t been to New York City (the hue and cry of the carriage supporters, many of whom haven’t been there either). Not only is the park not vehicle-free, the route to and from the stables is teeming with cars, taxis, snow removal vehicles, buses, and emergency vehicles. There is no requirement to surrender any horses to anyone. I may be wrong but I’ve never heard of a “city-appointed agency” that has been established for surrendered carriage horses. 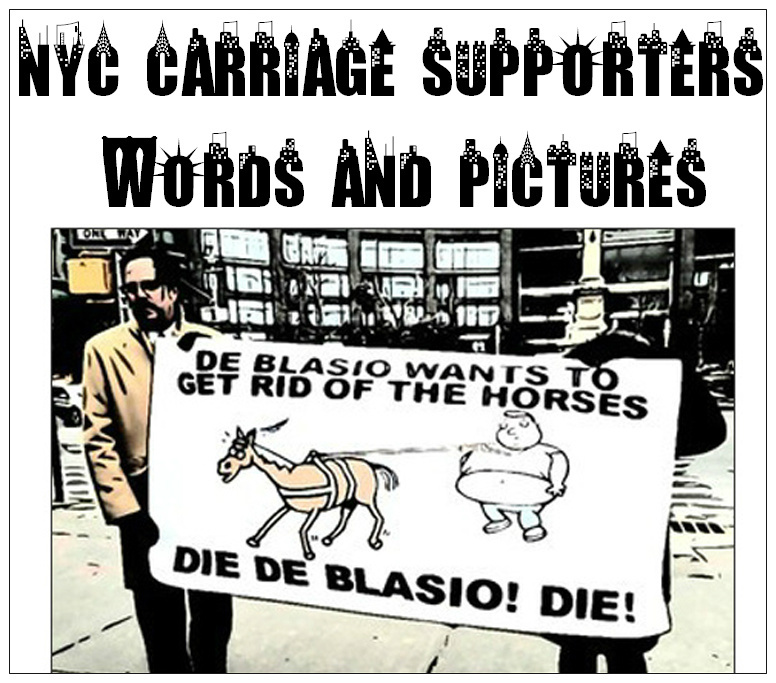 Making it so that you cannot operate a carriage in NYC is not seizing your property. The Bill does not require that horses be sold or donated, but the Bill does define the circumstances under which sale or disposal or the horse shall be deemed humane. While it does attempt to control what happens to the horses IF they are sold, it does not compel them to be sold. And since one supporter’s comment included here asserts that the carriage operators have farms, one can only wonder, if true, why they would need to rehome any horse anywhere else? Last month, Equine Canada, the comprehensive national governing body for equestrianism, replied to a direct question from Alex Atamanenko on Bill C-571, who asked for confirmation on their stance on the new horse slaughter Bill C-571. Quite frankly, their explanation for not supporting the Bill does not pass the smell test. Even though evidence of this debunking has been sent to Equine Canada not only by horse advocates but also in a letter written by MP Alex Atamanenko himself, they will likely never retract the reference or their support for the slaughter industry. Read the text under their banner ad on Facebook – it says, we are “…the industry sector leader and as such is recognized and supported by Agriculture and Agri-food Canada.” They snuck this in after the usual self-promotion about horse sport in Canada. The justification for horse slaughter using a debunked report is the latest in a laundry list of problems with EC, which includes their inability to retain their leadership or tackle the traceability issue no matter how many people make up their various committees. How many established organizations hire a CEO on a 1 year term anyway? By the time you send a communication to either an Equine Canada President or CEO/CFO, either or both of them have been replaced/left/terminated and there is no continuity carried forward with the next warm body occupying the position. 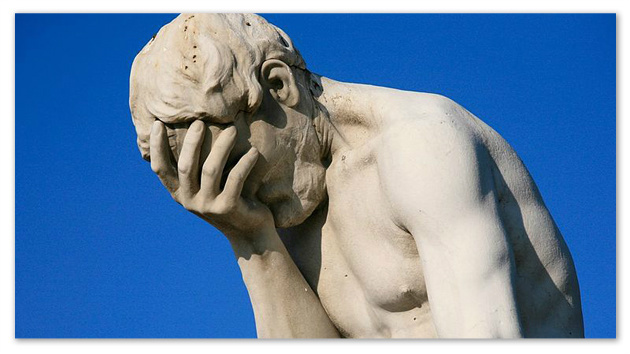 Maybe they should host a reality show, “Who Wants To Be Our Next CEO?” I’m not surprised (or disappointed) that the traceability/CanEQUID project seems to be floundering either – is it because the Board of Directors cannot commit to moving forward on it, or are they dysfunctional? If you take the time to write to the Board of Directors for Equine Canada, you may get a polite response, no response at all, or something like the above remark. Board members should always provide respectful responses to letters, even if they don’t agree with the subject matter. Would you want to belong to a federation with a board member who blows you off like this? travel costs covered through the lobbying efforts and direct grants available via EC, while the para-equestrians get considerably less. However, the vast majority of horse owners are not professional equestrians and therefore underrepresented by Equine Canada. What has EC done to promote Canada’s Trail Riding and Equestrian Tourism? I think trail riders in particular are unimpressed with EC, as they feel that the only benefit Equine Canada could have offered them was the trail system they were supposed to be putting together…but thus far have not. Non-competitors probably outnumber competitors by orders of magnitude. Who does the EC really represent except elite athletes and Agri-Food Canada? Anti-slaughter advocates need to take a stand by purchasing an Equine Canada membership for $10 and then attending the AGM, challenging them to adopt a non-slaughter position and to promote horse sport for all equestrians. Equine Canada’s mandate SHOULD be to promote horse sport. Full stop. They were never meant to be dabbling around in the bowels of slaughter and using themselves as a cover for Agriculture Canada’s sordid meat business. Will there ever be an end to the conflict of interest of created by Equine Canada’s mandate to promote horse sport and their entanglement with Agriculture Canada’s horse slaughter enterprise?